If you have found the California Mountain Atlas tables through a search engine, you should probably start at the California Mountain Atlas home page and familiarize yourself with some of the key concepts before returning to the tables. The tables include every summit in California with an expected prominence of 500' and greater. There are approximately 3,800 summits in the atlas. The tables are organized by Lineage Cells. Briefly, there are 163 summits in California with proven prominence of 2,000' and greater. They are well-distributed across the state's landscape in all regions. If you just want to look at the major prominences for the state, then you should go to the P2000 table and the P2000 map. 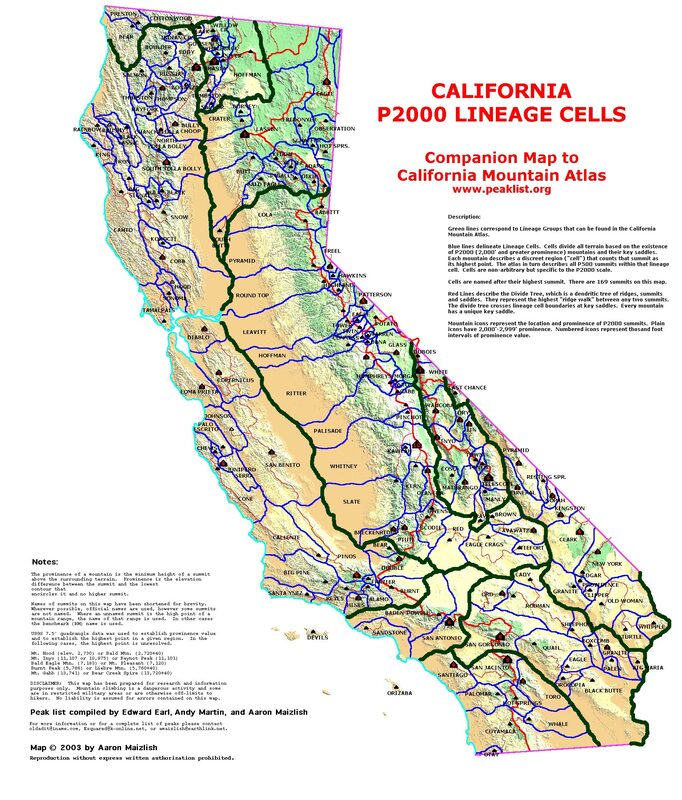 A separate California introduction page also compares the concepts of P5000, P2000, and P500. Each of the 163 summits has a group of summits in its environs that form a contiguous group. A Cell Reference Map provides a visual clue as to their shapes and locations. The groups are defined by a non-arbitary set of rules that are fully discussed in the theory section of this website. It is important to note that these groups do not necessarily represent a discreet place-name or mountain range, they are based purely on the shape of the terrain. Cells vary wildly in size. Several P2000 summits have no subsidiary summits in their group. These "monotypic" peaks such as Frazier Mtn. in Ventura County, and Shaffer Mtn., in Lassen County have little relief on their slopes above the contour at their nearby key saddle. At the other extreme, Mt. Whitney, North Palisade, Leavitt Peak in the Southern Sierra, and Snow Mtn., in the North Coast Ranges have over 100 subsidiary peaks in their cell. It is not surprising perhaps that different geomorphological regions have different average numbers of subsidiary peaks in their cells. The Southern Sierra has extremely rugged terrain that result in numerous sub-peaks, but very few low passes that would create multiple cells. The average cell has 23 peaks. Each table ranks the summits in descending order by prominence. IMPORTANT: My criterion for inclusion on this list is that a summit must have an expected prominence of 500' or more, given the contour intervals of the summit and saddle. This means that a summit with 480' of clean prominence and a 40' contour interval will be included on the list. A summit with 440' of clean prominence and combined summit and saddle contour intervals of 80' will not be included on the list. In this case the possible prominence values range from 440' to 520', and therefore the peak could be said to have a 25% probability of being a ≥500' prominence (using a linear distribution model). As the peak only has an expected prominence of 480' it is not included. The rationale is to avoid the multiplicity of mostly unnamed peaks that have a low probability of acheiving 500' promiennce. Given 80' combined contour intervals, 480+80 is always included and 440+80 is never included. I welcome additions of peaks that are estimated to have a prominence of ≥500' after site investigations. As a default measure, summits on this table are as they appear on the USGS 7.5' topographic maps. In subsequent revisions of the Atlas I hope to add many unofficial names and to correct USBGN names that are omitted or are otherwise inaccurate on the 7.5' maps. Peaks in quotation marks are non-official names. USBGN official place name for a mountain or summit whether or not the name appears on the 7.5' topographic map. Unoffficial name for a mountain or summit that is in common usage in the hiking community or otherwise. The name appears in the table in quotations. Name of a nearby named peak if the highpoint is functionally on the same summit block or plateau. In many cases, a well-known named peak is slightly lower than a higher point nearby (but often less visible from below), c.f. Glass Mountain. The place name will be employed where the named point and the high point are not separated by a low saddle and are one mile or less apart. These are denoted in the tables as "nr." Name of an official (USGS or NGS) benchmark. In most cases the benchmark will be noted and named on the 7.5' map. These are denoted in the tables as "BM". Name of the mountain range if the peak is the high point of that range and does not merit its own BM. This is a frequent occurance in desert ranges. The peak will be denoted as "HP", such as "HP Arica Mtns." The spot elevation provided on the 7.5' map, where no place name is known. In most cases this will be denoted as "Pt." such as "Pt. 3083". In some cases in the High Sierra, where R.J. Secor confirms that there is no known summit name, I denote the table as "Pk. 12530", to signify that this is the 'working name' for the peak. Values from metric 7.5' maps are denoted with an "M", such as "Pt. 3581m" to signify a peak of 11,749' elevation marked on the topographic map with a spot elevation of 3,581 meters. For the first version of the Atlas, the vast majority of elevations are taken directly from the USGS 7.5' maps. In many cases, I have used the GNIS elevation if the following three conditions are met: 1.) A spot elevation is omitted from the USGS map. 2.) The value provided by GNIS is within the contour interval stated on the topographic map. 3.) We do not have any other secondary source of spot elevation information, such as benchmark data, or elevations provided on smaller-scale topographic maps. GNIS is notoriously inaccurate. Elevations are often wrong by hundreds of feet. I feel that the above conditions improve the overall quality of the data; because inclusion of the GNIS data in these instances often compensates for simple errors of on the USGS map. I ignore GNIS entirely if it is out of the bounds of the topographic contour. All of the elevations on the USGS maps are from the superceded NGVD29 vertical datum. This system, based on an earlier conception of the geoid model should be considered obsolete. Modern elevations are based on a different methodology, developed in 1988, and on a much more sophisticated geoid model. Analysis of the two systems is beyond the scope of this page, but perhaps I will write a later article for the theory section. Modern elevations, using the NAVD88 vertical datum and GEOID03, will typically differ between -5' and +15' from the printed elevations. In cases where I have used NGS data to supplement elevation information in the atlas, I always quote the superceded survey data, based on the most recent application of NGVD29 found on the benchmark tearsheets. This is so as to compare "apples and apples". Prominence data, of course, needs to employ the same datum for both summit and saddle to maximize accuracy.